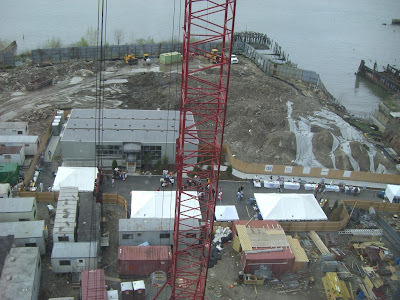 This past Saturday was Toll Advantage Day at the Northside Piers project in Williamsburg. 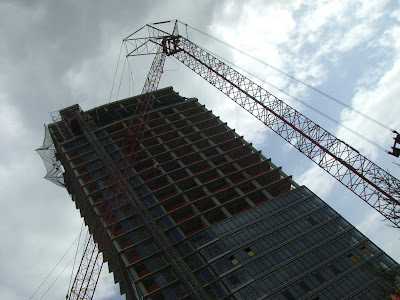 The Toll Brothers company is building a huge glassy building on the water and Toll Advantage Day was an opportunity for friends and families of Toll employees, prospective buyers, and the just plain curious to check out the building's progress. Of course it takes a little more than just an invitation to lure people down to a construction site, so Toll offered up a big picnic for all. Free local Mexican food (great guacamole! ), free hotdogs, free hamburgers, free popcorn, free cotton candy, free sodas, free facepainting for the kids, free magician, free spin art, free caricatures, free hardhat construction tours, free parking, free raffle for a 42 inch plasma TV, free swag bags (included Toll-branded notepads, water bottle, pen, coffee mug, house shaped mints), free shuttle from the subway or Manhattan, and the major draw for me (besides guacamole of course)- free beer! 5 or 6 types of bottled Brooklyn Brewery beers for the taking. 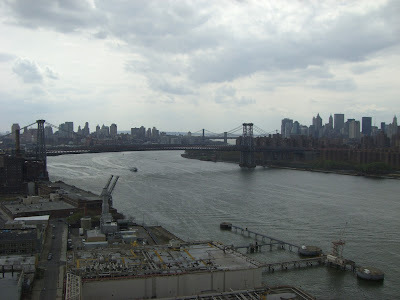 As you can see looking mostly east- the Northside Piers building completely towers over everything in Williamsburg and beyond. Here's looking straight down towards the tented festivities and the sales office. The sales office had some model kitchen and bathrooms that had real beautiful fixtures, particularly the kitchen countertops- very nice stone. They also had a scale model of the entire complex which will include a rebuilt pier and 2 other large buildings to be built somewhere within the frame of the picture below. Of course the big question that potential buyers were asking was- how will the 2 buildings alter my (currently) awesome view? From what I could overhear, Toll representatives were being extremely honest, and pointing out what their exact views would be on the scale model. They also mentioned "view corridors" which I suppose means limited views between the other buildings- perhaps they are being carefully positioned on the site to preserve views from each line of apartments? Very interesting day. 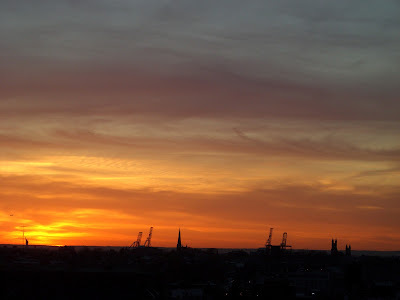 Wicked sunset over the brownstones and steeples of Carroll Gardens and the huge cranes of Red Hook docks. 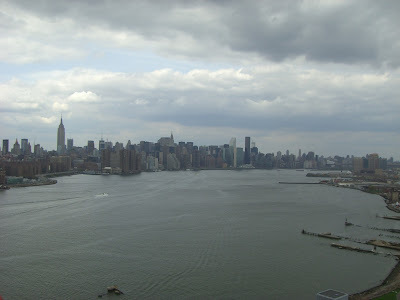 Note the Statue of Liberty standing tall in the bottom left corner and a plane taking off from Newark just over her head. 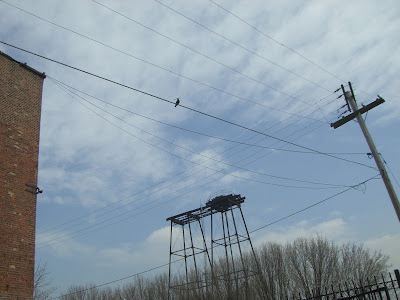 A bird up on a powerline in Red Hook, just outside Steve's Authentic Key Lime Pies. Looks like it might be a starling but I can't really tell from the photo. The bird has some nesting material in it's beak. Do starlings like key lime pies? That's a surefire question for the Mythbusters, but I have seen a seagull down a hotdog in a single gulp. Not the bun, just the dog- Koboyashi style, shake included (the Kobayashi shake, not a milkshake- everyone knows birds don't like dairy). 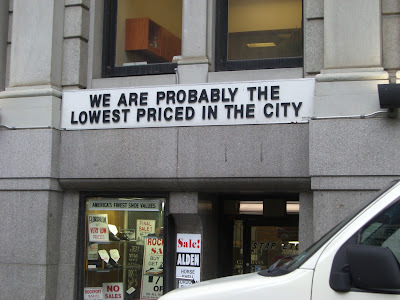 This shoestore opposite Trinity Church is probably the lowest priced in the city. Talk about not having complete confidence in your pricing. Or perhaps it's lawyerspeak for don't sue us if you find a better price. Either way, you can probably find the shoes you are looking for here and they probably have it in stock in your size. They probably take Mastercard. 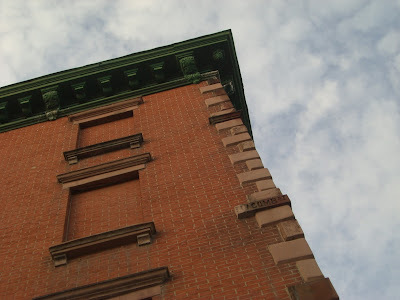 Some real nice looking rooflines over in Fort Greene. 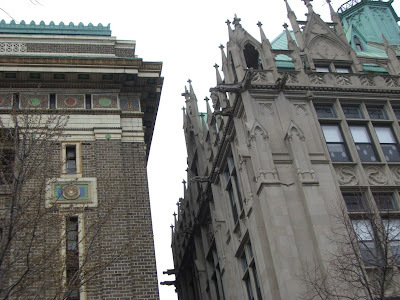 On the left is the Brooklyn Masonic Temple and on the right is Queen of All Saints School (I'm pretty sure this is the school and the associated church is around the corner). The colors on the Masonic Temple are just splendid. Stay dry! There were some real vicious looking clouds out all day yesterday. 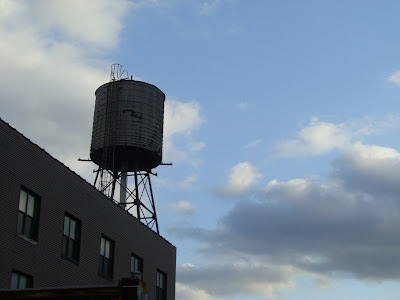 Here's a water tower in the Gowanus area. 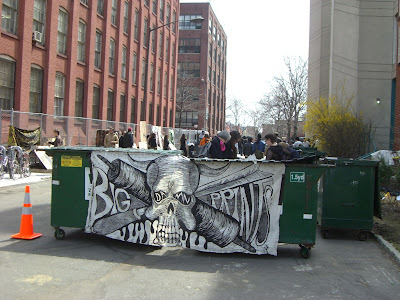 Today was the 3rd annual Big Damn Prints event at the Pratt Institute. 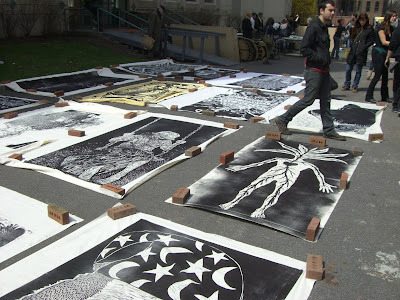 Pratt students and faculty created giant 4 foot by 8 foot woodblock prints. 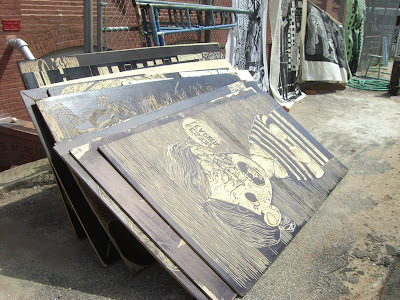 They carved their print into big pieces of wood, then rolled ink all over them. It has to be done in a mirror image to get the desired results. The final result is a collection of really cool big damn prints. Here they are in the drying area. Huge! Crazy event. 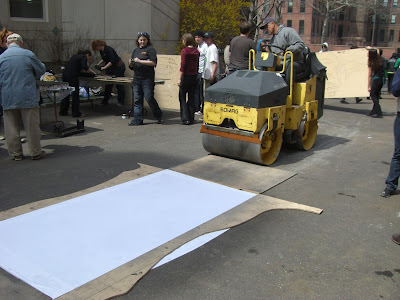 A steamroller! The students had a table where they were selling some really neat smaller prints on paper dirt cheap- $10, $5 and $1 to raise money for the printing club. 1. 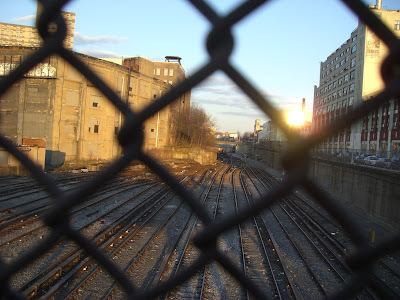 The sun is not actually setting over the train yards- it's behind you from this viewpoint. That bright thing on the right is just a nasty reflection! I probably should have tried to block it out a bit with the links from the fence but hindsight is 20/20 I guess. 2. It's not actually Atlantic Yards. Wait- what? 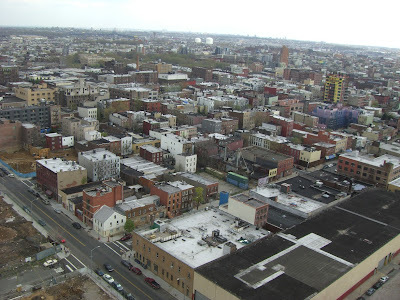 It will be Atlantic Yards. Maybe. Well, probably. It's currently the MTA/LIRR's Vanderbilt Yards and is the probable future site of Bruce Ratner's Atlantic Yards project, which will include 16 buildings of up to 58 stories tall and a new arena for the future Brooklyn Nets- pending approval of course. The area visible in these photos, including the buildings at left, represents by my really rough calculations about 1/9th of the total project area. A project this large is obviously going to be open to great public scrutiny, which is why I used so many hesitant adjectives in the preceding paragraph as the project is currently mired in lawsuits over a variety of issues. 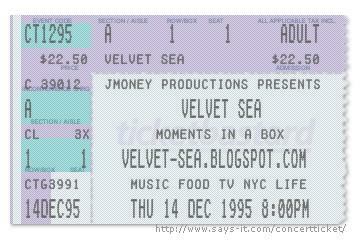 Velvet Sea is currently in favor of developing the site but against the general height and bulk of the towers as proposed. 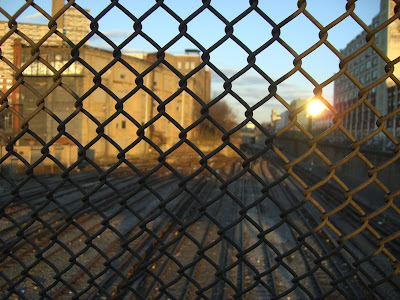 I am against the use of eminent domain to confiscate properties for this project unless the developer can prove that it is absolutely necessary to make it economically viable and there is significant benefit to the general public (I'm leaving the definition of significant benefit purposely vague for now). I feel the developer has been less than forthcoming with much of the information and therefore causing himself to appear underhanded and shady. Meanwhile I feel the opponents are doing themselves a disservice by attempting to harp on some really ridiculous points, making themselves seem less credible in the process, despite their valid arguments. Form your own opinion- everyone's doing it! Here's the developer's site and here's a major opponent's site. Get informed, it's Brooklyn and New York's future at stake. 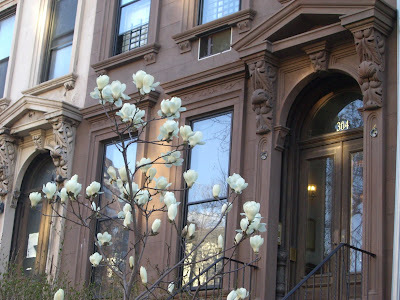 Spring has sprung, especially here in blooming and booming Clinton Hill. I bet the cougars are out. Happy Easter from everyone here at Velvet Sea (all 1 of us) and from this overly ambitious decorator over in Carroll Gardens. 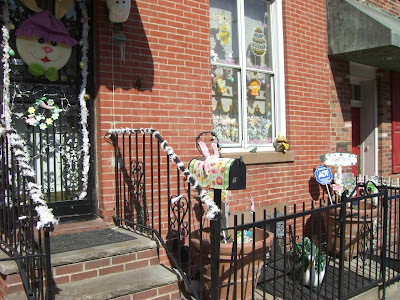 Don't even think of stealing any of these Easter decorations as they are protected by ADT. I guess that sign would be an Easter egg of sorts in the photo. Did you attend New York's Easter parade today? I'd like to take this opportunity to make my annual plea to McDonalds to bring the Cadbury mini eggs McFlurry over to the United States. Please Ronald, please please please do it! 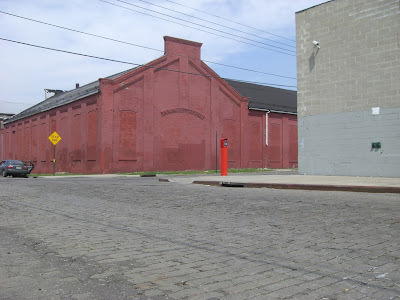 Warehouse or something at the edge of Red Hook. Here's an interesting sign carved into this old building at the corner of 5th Ave and Garfield Place in Park Slope identifying the street as Macomb St (the other side of the building-not shown- says "Fifth Ave"). The street was originally called Macomb St until sometime after 1881 when President James Garfield- our first ambidextrous President- was assassinated. Forgotten New York speculates that it was named after Alexander Macomb Sr, a wealthy merchant during the Revolutionary era and builder of one of George Washington's houses on Broadway in Manhattan, back in 1790 when NYC was the capitol. I'm going to go out on a limb here, disagree with Forgotten NY and guess that it's actually named after his arguably more famous son, Alexander Macomb, Jr- a hero of the War of 1812 and commanding general of the US Army from 1828-1841. I'm unsure when the street was actually named (which would be a big help) but it does appear on this 1855 map which places it after the death of Jr. in 1841. The name change to Garfield Place occurs sometime between Garfield's death in late 1881 but prior to 1891, as it's on this map from that year. Did you know that Alexander Graham Bell invented a crude but working metal detector in an unsuccessful attempt to locate the bullet in Garfield's chest? Also part of Garfield's assassin's brain is on display at the Mutter Museum in Philadelphia. Unfortunately for our ex-President, 97 years after his death, a big orange lasagna-loving cat of the same name would make his comic strip debut and within 10 years become the more famous Garfield. James A. Garfield died on a Monday and Garfield the cat hates Mondays and today is Monday- coincidence? Wow this has become way more involved than my original idea for this post which went something like "check out the sky and the incorrect sign on this building- cool". 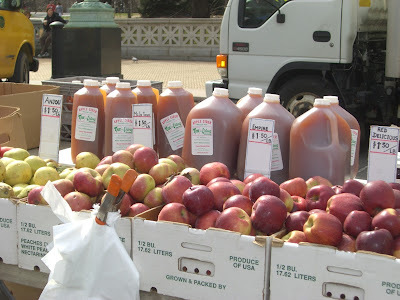 Apples and cider from the farmer's market at Grand Army Plaza.